The nation’s most senior Odd Fellow, Carl Schmidt of 2729 West Pico Street, died at aged 95, after a brief illness. Schmidt was born in Germany in 1812, and emigrated to Philadelphia at 18, where he was known as a locksmith of great facility. He joined the Odd Fellow’s Lodge No. 12 at 21, and in 1852 moved with his wife Joanna to Madison, Wisconsin, then a tiny trading post, where he co-founded Lodge No. 17. He maintained active memberhip in this lodge until his passing. 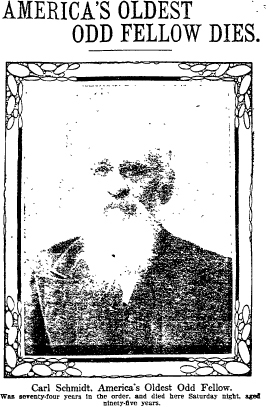 Joanna Schmidt died in 1900, and the following year Carl moved to Los Angeles to live with their daughter, Mrs. Gus Kleaman. A week before his death, Schmidt gained the distinction of being the oldest person to spend an hour under anesthesia, as surgeons attempted to repair a rupture he had suffered at age 8, which had lain fallow for eight decades before becoming an irritation. He appeared to rally from his surgery, but complications set in, and he died at home surrounded by his family. The funeral was held at his bedside, under the auspices of the Odd Fellows.